THE DANNY RUMPH IS BACK! This is Philly’s premier professional basketball tournament and you never know who might show up. Over the years it has featured The Morris Twins, Kyle Lowry, Lou Williams, James Harden, and many more! Game schedule and information about this legendary tournament below. #Salute to Mike Morak and the Danny Rumph Foundation staff for starting such a great organization. 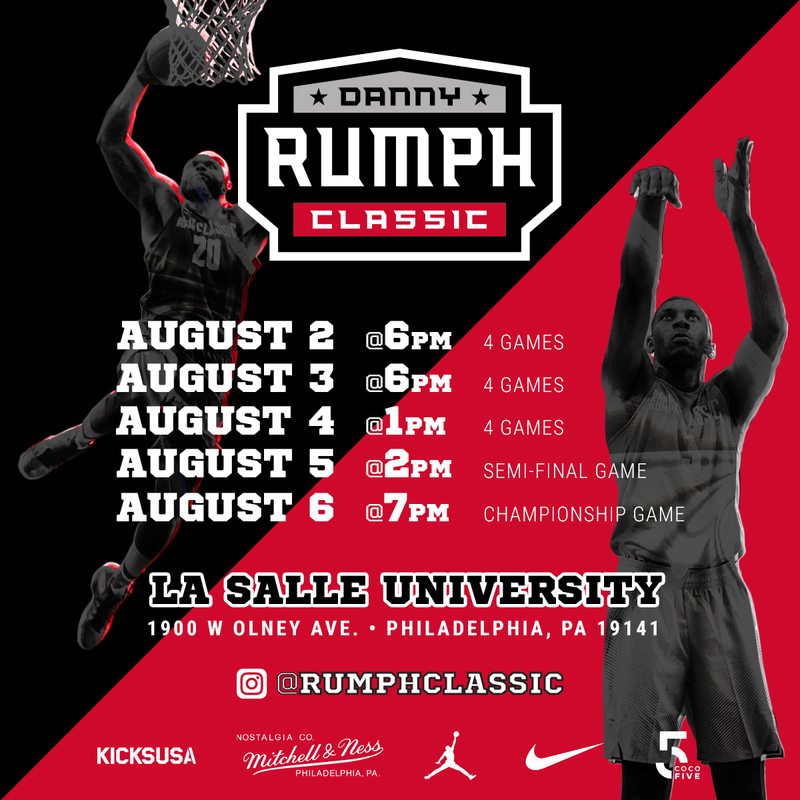 Danny Rumph Classic Basketball Tournament has become one of the premier basketball tournaments in the city of Philadelphia and the signature event for the Daniel E. Rumph II Foundation. The tournament is held in honor of Danny as a tribute to the game he and so many others love. Danny died of a heart condition in 2005 at The Mallery Recreation Center, now the Daniel E. Rumph II Recreation Center. Mike Morak and some other friends started the first Rumph Classic basketball event. And what started out as something small in Philly has grown to one of the east coast’s most popular summer events. The Danny Rumph Classic Basketball Tournament and its supporters are a direct reflection of the kind of person Danny was and the amount of respect that others players still have for him. The DERII Foundation raises money to fight Hypertrophic Cardiomyopathy (HCM) and to raise awareness of HCM in the community. HCM is the leading cause of Sudden Cardiac Arrest. The tournament honors those who have been screened for HCM, and remembers those who have lost their lives to this disease. The DERII Foundation has been fortunate enough to work with many wonderful people through this event but the unfortunate part is the impact that HCM continues to have on so many lives. Thus the reason The Daniel E Rumph II Foundation continues to spread knowledge of the disease that took the life of Danny. Each year about 100,000 young athletes die from all cardiovascular disorders, including HCM. Of the 100,000 deaths, 45,000 play basketball. The Tournament allows the foundation to continue the fight in educating other athletes about the disease. They appreciate you taking the time to visit our site and learn about our cause and welcome you to the Danny Rumph Classic. Next Story → BRANDON AUSTIN is a PRO!! The FOOTAGE don’t LIE! !